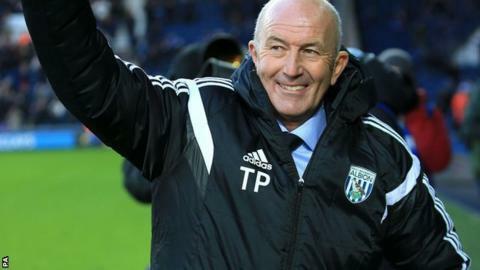 West Brom head coach Tony Pulis says there are no hard feelings in the wake of Paul Jewell's surprise departure from his backroom team. Jewell left on Tuesday after being appointed by Pulis just a week earlier. The 50-year-old has since claimed his exit was not by mutual consent and is taking legal advice. "I wish Paul all the best, I still think he's a great lad. Good luck to him," Pulis said. "There's no hard feelings my way or the club's way." Pulis, who intends to bring in a new assistant coach to replace Jewell, added: "I've got great respect for Paul, he's a tremendous lad and had been out of work for a long time. "I offered him a job but it didn't work out. I was pleased to have him in and sad to see him leave so quickly." The former Bradford, Wigan and Derby boss departed after Gerry Francis' appointment as a part-time consultant, a move that BBC Sport understands required Pulis, his long-term assistant David Kemp and Jewell to take a pay cut. "Gerry was always joining us," Pulis said. "He's been with me for seven years, Kempy for 13 and they were always coming. Gerry brings a wealth of experience. There was never any question of him not coming." Asked if Jewell's exit was because of a pay cut, he said: "You'd have to speak to Paul. For me to talk about someone else and what they think or don't think, that's wrong. Paul will talk about that." He added: "We were going to make a gesture for Gerry, and that was what we thought was right and proper." Jewell was not immediately available for comment when contacted by BBC Sport.